Pirate Class will finally have Epic Quest and Epic Weapons in April on Conquer Online 3.0. The Surging Pirates Expansion will be updated on April 12th. To celebrate the release of new expansion. 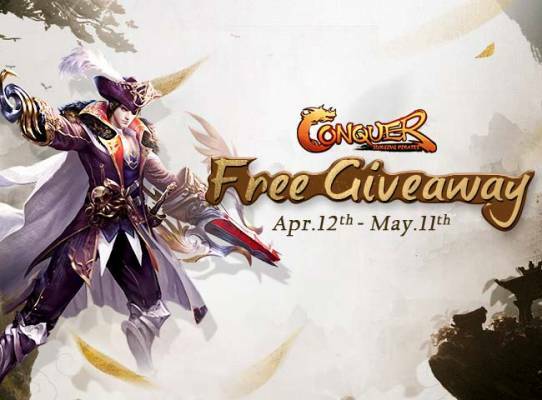 Conquer Online team join hands with Ocigrup to provide wonderful gift packs for new players to challenge numerous martial artists in the world of Conquer! EXP Ball (B) * 10; EXP Potion (B) * 10; 3-Day Mew Accessory Pack * 1; +3 Stone (B) * 7; +3 Steed (B) * 1; Dragon Ball (B) * 5; 30-Day Wild Camel Mount Armor; 30-Day Imperial Robe Garment; Pirate Treasure Box. Novice Equipment Pack:Open to get a set of level 15 Super +3 equipment (B) of your class. 2. One gift code per account per IP. Step 3. Head to Conquer Online in order to create a new account, then download the game and create a new character. Step 4. Head to the Event Site, introduce your character info and introduce the code. You'll find your items in your in-game mailbox.